Movado Watches have a style like no other. You can recognize that style and design a mile away, and that’s how Movado has become so successful…that ands the fact that they make a fine Swiss quality precision watch. Movado watches have flare nd their streamlined look has a broad reaching appeal. One of Movado’s new watch releases is the Esperanza. The 606280 Men’s Esperanza Movado watch has the classic Movado look, with some new features and updated finishes. This is a vertically-linked bracelet set in shining stainless-steel. This is a solid men’s watch in a large size. The Esperanza Movado watch has a diamond bezel and of course, the signature jet black museum dial. I love its understated elegance. Not often can you place diamonds on a men’s watch without an overpowering affect, Movado has done just that. As with all Movado watches the 606280 Men’s Esperanza Movado is all Swiss-made. That means quality and durability you can count on. 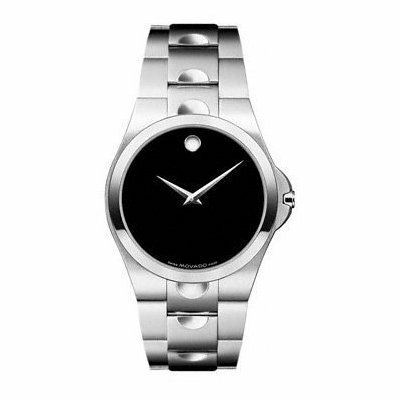 Movado watches are a timeless classic. The style of these watches is never outdated, and with the Movado name behind them, quality is always in place. Check out all the new releases from Movado watches…I promise you’ll find one you love!